Folks at Larson Family Winery like to have fun, and it shows from the minute you turn down the long driveway. If you’re traveling with kids or just consider yourself a kid at heart, this winery is a must-visit when in the Carneros region of Sonoma County wine country. Visitors are encouraged to taste and play here. 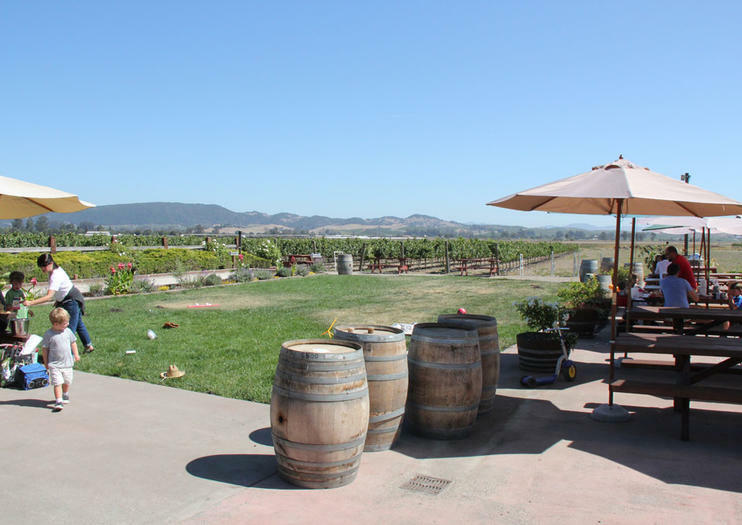 Just outside the barn turned tasting room is an open space overlooking the winery’s Estate Chardonnay Vineyards where you can play bocce ball, horseshoes and an assortment of lawn games like ladder golf or corn hole. There’s also a large field perfect for a game of catch or showing off some soccer skills. Pack a picnic, as tables are available. Dogs are welcome and are a common sight, so you’ll regret it if you decide to leave your pooch at home. The Larson Family Winery Tasting Room is open daily from 10am to 5pm. Picnic times are 11:30am to 1:30pm or 2:30 to 4:30pm and require a reservation. Hours: Tasting room is open daily from 10am to 5pm.